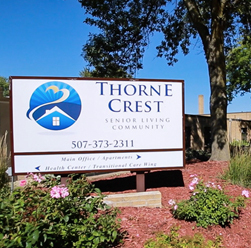 Built in 1975, Thorne Crest Senior Living Community has been serving Albert Lea and the surrounding area for over 35 years. This unique senior community reflects the cherished hometown values and beliefs of Albert Lea itself; a commitment to community, a dedication to service and caring for others. Located in a quiet, residential neighborhood, Thorne Crest offers the best in senior living today. The campus and programs are designed to afford seniors the full continuum of senior care options. From our spacious, independent apartments to the home like atmosphere of our care center, Thorne Crest can meet the full spectrum of today’s senior’s needs without ever leaving our campus. Thorne Crest is owned and operated by American Baptist Homes of the Midwest (ABHM), a not for profit provider of senior living and health care since 1930. ABHM has been providing health care, affordable housing, and supportive services to people of many ages, cultures, and conditions for over 80 years. As a not-for-profit, faith-based organization, our mission is to create healthy Christian communities that empowers older adults. We provide choices for housing, services, and technology that enrich body, mind and spirit. Our mission is to create healthy Christian communities that empower older adults. We provide choices for housing, services, and technology that enrich body, mind and spirit. Interested in seeing Thorne Crest for yourself? We invite you to come and take a tour of our facility.